Is Aphex Twin releasing new music or a synth? But what kind of product is it? Remember those spec-heavy synth ads you used to see in music technology magazines back in the '80s and '90s? It looks like Aphex Twin does, because he's paying homage to them in a new flyer to publicise his forthcoming Cheetah EP - whatever that is. We're assuming that this is an actual EP, but if you read the text on the flyer, which appears to have been sent out to record stores such as Norman Records, you'd think that the man also known as Richard D James is about to launch a new piece of hardware. UPDATE: The text appears to paraphrase the manual for the Cheetah MS800 digital wave synth module, and the specs are also the same. What that means... we have no idea. 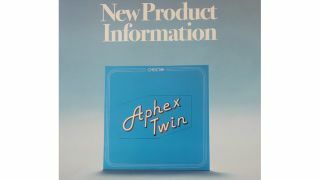 "The Aphex Twin Cheetah EP uses digital sound generation techniques combined with wave sequencing technology to bring you sounds with movement and depth rarely found on records today. "To assure you that your Cheetah EP will give you many years of enjoyment, please be sure to read the owners manual carefully before attempting to operate the Cheetah EP. "If you wish to experiment and create some sounds of your own, first try editing some sounds we've already made for you, before attempting to create a patch from scratch. "We sincerely hope that having battled through the programming of the Cheetah EP, you have not become familiar with the exceptional potential of this record. "Have fun programming, and if you create any superb patches and tones which you feel deserve to be appreciated by other Cheetah EP buyers, send a MIDI System Dump of them, on a disc to us at WARP and if we also think they are superb, you could be rewarded for your efforts. Try us!" We're not quite sure what to make of all that, but presumably we'll hear more from WARP Records in due course.